Diners stand and eat at an Ikinari location in Japan. If you love steakhouse quality steaks but hate – uh – sitting, America’s latest Japanese restaurant import, Ikinari Steak, may prove to be your new favorite eatery. Ikinari Steak is an amazing success story in Japan. 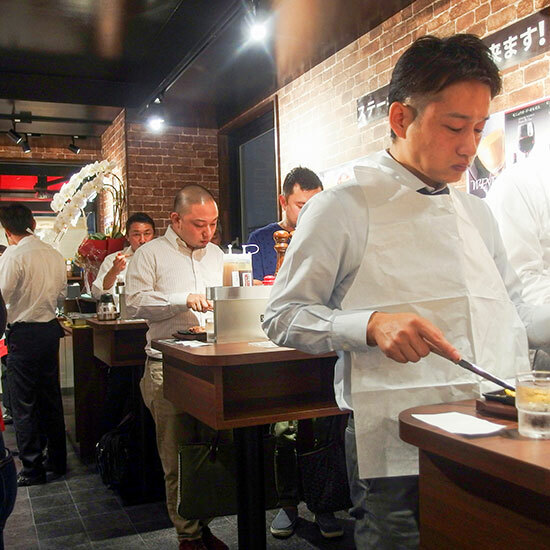 Chef Kunio Ichinose opened the first of these quick-service, mainly standing-room-only, high-end steak concepts in Tokyo in December of 2013. Today, over 100 locations exist throughout Japan, including over 60 in the Tokyo area alone. As of this Thursday, Ikinari Steak is officially getting its first American iteration in New York City’s East Village (though, apparently it's already soft-open) – and if things go well, Takashi Tsuchiyama, who’s running US operations for the brand, told Eater the “conservative target” is opening 20 locations in Manhattan in the next five years. Had lunch at the new Ikinari Steak on 10th Street (down the block from Tim Ho Wan). So fun, most of the tables are standing only, and it's like stepping into Japan. Give it a try! It officially opens on 2/23. But back to the steaks: The beef, which comes from Aurora Angus Beef in Illinois and is wet-aged for at least 40 days, is cut to order and weighed right in front of customers before being cooked on an open fire. Steaks are served up with a daily vegetable, and then slapped down on a cast-iron platter that will continue to cook the meat to the customer’s liking. Once back at their standing station, diners can also season their steak to taste, including dousing it with a “Japanese soy-based signature steak sauce” which makes it a proper “J-Steak,” as Ikinari calls it. Overall, the concept certainly sounds good for a novel experience, but whether it will appeal to an American audience over the long haul may be more interesting to follow. Pricewise, Ikinari Steak offers a significant discount over a traditional steakhouse, especially since no tipping is necessary, but at the same time, the food isn’t cheap. For instance, grabbing a minimum order 200 gram (7.1 ounce) filet is $22. That’s significantly less expensive than a steakhouse chain like Ruth’s Chris, but also doesn’t make Ikinari Steak a suitable replacement for, say, grabbing a burrito bowl. Not that it’s supposed to, but when meals sometimes only last about 30 minutes, a different sort of cost-benefit analysis kicks in. Regardless, it sounds like you’ll know pretty soon if Ikinari Steak is successful in the US – because at the rate they’re expanding, you’d probably see one on your block this time next year.